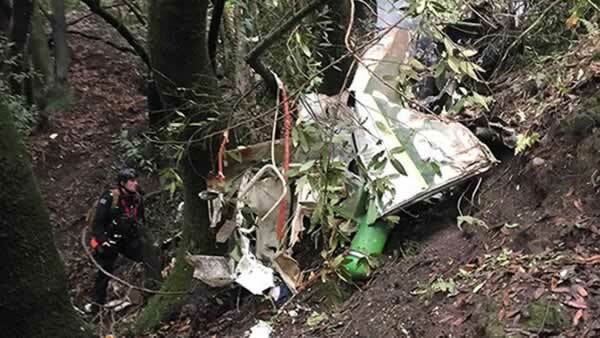 CASTRO VALLEY, Calif. (KGO) -- Efforts to recover the body of a pilot after his small plane crashed in Alameda County just miles from Oakland International Airport are on hold Tuesday night. Sheriff's deputies say the plane went down in steep terrain. That, combined with the darkness and the recent rain, will delay the operation until Wednesday morning. John Sacco was on his way to Oakland from Lincoln in Placer County. He lost contact with air traffic control around 11:30 a.m. Tuesday. Search crews found the wreckage in a deep canyon near Palomares Road in Castro Valley. Officials believe weather may have played a role in the crash. "It's a fairly large area of wreckage, looks like the plane may have clipped some treetops before crashing into the ground. It's a very rough, difficult terrain. It's probably had 3 inches of rain in the last 24 hours, so it's very muddy, slippery, difficult to get to," Alameda County Sheriff's Dept. spokesperson J.D. Nelson said. Deputies will remain to secure the scene overnight. Sunol Update: 2 @AlamedaCoFire Firefighters were injured during ground search for the missing aircraft. Injuries are non life-threatening.